The AIANH Intern/Young Architect Design Competition was created to provide an opportunity for interns and young architectural professionals to strengthen their design skills, gain recognition, and assist a community with their design challenges. 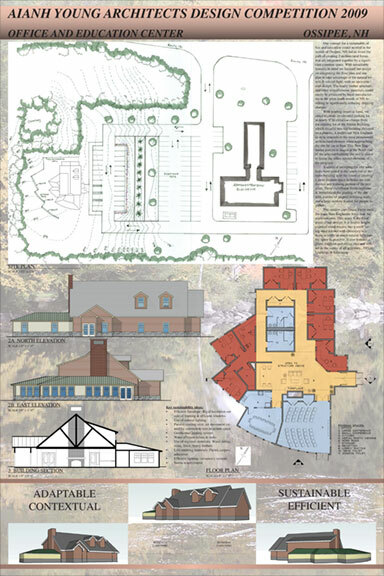 It is open to all New Hampshire architectural interns and architects within five years of registration. Participants do not need to be members of AIA. 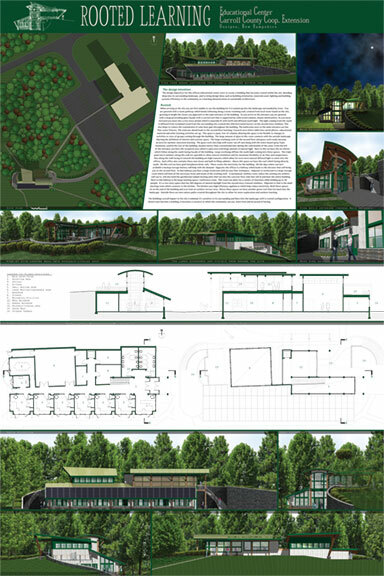 The program for the 2009 design competition was for a new office/education center for the town of Ossipee and the Carroll County UNH Cooperative Extension. A jury of professionals judged the submissions, with honors presented at the annual AIANH Awards Banquet January 16. 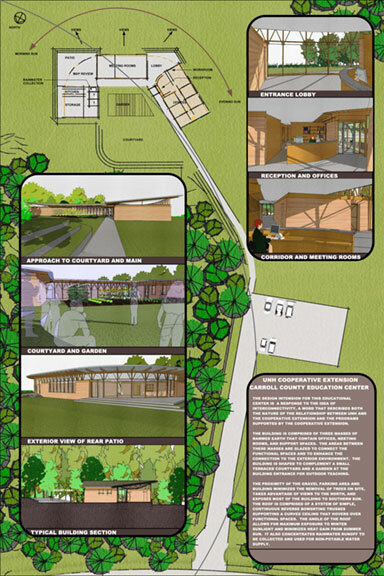 As would be appropriate for this use, the design clearly considers how to reduce the building's impact on the site. This was done by using the terrain to mask the mass of the building, locating the structure alongside (vs. on top of) the tree-covered knoll, sharing vehicular access and attaching the new parking to the existing lot. The design takes a thoughtful approach to solar orientation including the orientation of internal spaces. The earth-protected northern exposure works both for microclimate and to set up two distinct outdoor zones for different uses. The plan organization is clear and straightforward, with some public/private issues still in need of resolution. All in all it would be a fun and functional building, in harmony with its mission and interesting enough to make us want to visit. Well done. Shawn Bolduc, Assoc, AIA and Sothea Chhun, JSA Architects Interiors Planners. This design recalls the familiar forms of house and porch while tweaking both in response to the building's environment. This carries the educational message that environmentally responsive design need not be "unconventional" in appearance and therefore applicable in everyday life. The plan organization is the true strength of this proposal, with clear organization of functions and appropriate zoning of public and office spaces. The wood truss and fireplace theme would create a welcoming and attractive surrounding for visitors. Mo Gagnon AIA, Lavallee Brensinger Architects. This design took a novel approach to siting that puts the visitor more in touch with the land (i.e. more walking outdoors) and minimizes the building's disruption to existing landscape features. The building and its siting take full advantage of solar orientation. The thoughtful building section design allows the north-side courtyard to still see some sun. The potential drama of entering the building on the low side and enjoying the relatively transparent structure opening expansively to the south is an educational opportunity in itself. The functional plan organization, with its compact work area, lends itself to efficient zoning.